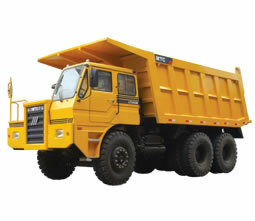 We are an experienced mining dump truck manufacturer and supplier in China. With several decades' years of experience, we are able to provide a wide variety of models of mining tippers with superior quality and provided at reasonable prices. 1. Our dump trucks are custom-made for mining industry and feature strong heavy loading capacity, excellent reliability and high economical efficiency. 2. Our adoption of advanced tipper manufacturing technology, rigid process control and inspection ensure that each of our mining dump trucks meets the severe operating requirement in bad mining environment. So, customers can feel secure in using this heavy truck. 3. The engine of MTC mining dump truck is designed based on common rail and EFI technologies, which effectively reduces the emission and fuel consumption. This makes our MTC dumper truck an environmental friendly heavy vehicle. 4. Equipped with intellectual control system and GPS management system, this mining tipper lorry is able to provide the optimum schedule for construction management in mining area. For the detailed specification information of our mining trucks, please click to the parameter forms. In addition to dump trucks, we can also manufacture agricultural machinery and construction equipment, like farm tractors, combine harvesters, wheel loaders, road rollers, and forklift trucks, etc.